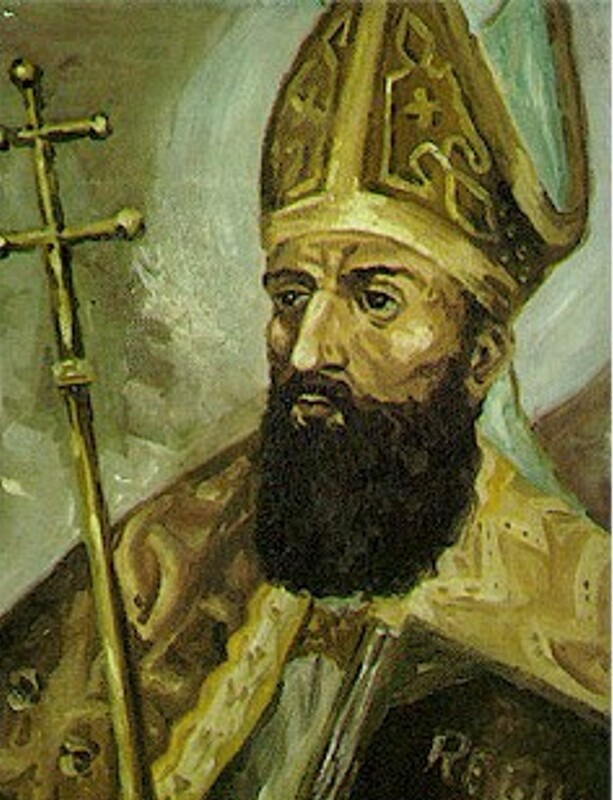 St. Albert of Jerusalem was born Albert Avogadro in Castel Gualtieri in Emilia, Italy, about 1149, probably to a noble family. He was educated in theology and law and was an outstanding ecclesiastical figure in the era in which the Holy See faced opposition from Emperor Frederick I Barbarossa. Serving as a mediator in the dispute between the emperor and Pope Clement III, Albert was made an imperial prince, a sign of favor from Barbarossa. In 1184 he was appointed as the bishop of Bobbio, Italy, and soon after he was named to the See of Vercelli, where he governed for twenty years. It was during this period of service that he served as mediator between the pope and emperor and undertook diplomatic missions of national and international importance—with rare prudence and firmness. In 1191, he celebrated a diocesan synod which proved of great value for its disciplinary provisions which continued to serve as a model until modern times. He was also involved in a large amount of legislative work for various religious orders: he wrote the statutes for the canons of Biella and was among the advisers who drew up the Rule of the Humiliates. In 1194, he effected a peace between Pavia and Milan and, five years later, between Parma and Piacenza. In 1205, at the age of 54, Albert was appointed the Patriarch of Jerusalem, a post established in 1099 when Jerusalem became a Latin kingdom in the control of Christian crusaders. The position was open not only to persecution but to martyrdom at the hands of the Muslims. Albert accepted and he proved himself not only diplomatic but winning in his ways. The Muslims of the area respected him for his sanctity and his intelligence. He arrived in Palestine early in 1206 and took up residence in Acre (now called Akko) because, at that time, Jerusalem was occupied by the Saracens (ever since 1187 when they captured it). He was involved in various peace initiatives, not only among Christians but also between the Christians and non-Christians, and he carried out his duties with great energy. He also became involved in a concern that assured his place in religious history. Overlooking the city and bay of Acre is the holy mountain called Carmel. At that time, a group of holy hermits lived on Mount Carmel in separate caves and cells. In 1209, Albert was approached by St. Brocard, the prior or superior of the group of hermits, who asked him to draw up a rule of life for them—a rule that would constitute the beginning of the Carmelite Order. The Carmelite Rule of St. Albert of Jerusalem, the shortest of the rules of consecrated life in existence, composed almost exclusively of Scriptural precepts, was given to the Brothers of the Most Blessed Virgin of Mount Carmel. The approval was the first recognition by the Church of this group of men, who, the Pontiff said, “imitated the sublime examples of Our Lord, the Blessed Virgin Mary, and the Prophet Elijah.” The Rule included severe fasts, a perpetual abstinence from meat, silence, and seclusions. Friars, nuns, and lay people in the Carmelite Order all over the world are very familiar with the Rule—which, over the centuries, has been read, reflected on, and interpreted in many different ways. The flexible nature of the Rule gives great scope for living it out in the monastery or the active apostolic life. Conform their will to that of God, seeking the will of God in faith, in dialogue, and through discernment. On September 14, 1214, at the age of 63, Albert was assassinated in the Church of St. John of Acre during a procession on the Feast of the Exaltation of the Cross. His assassin was the disgruntled former Director of the Hospital of the Holy Spirit, whom Albert had rebuked for wrongdoing and ultimately demoted. Albert was stabbed three times and died in his liturgical vestments. As he was dying, he asked for forgiveness for his murderer. Albert's writings still bring a message to today's world. The words of Scripture seem to flow almost unconsciously from his pen; he was so steeped in the Word of God that it penetrated his very thinking. Albert can also be an inspiration to those in leadership roles, especially within the Church. He did not impose all his own ideas on the group of hermits who came to him, but instead listened to what they told him about their way of life, and then adapted it and gave it structure. In the instructions he gave to the first Carmelites, he is careful not to be too demanding or rigid. He stressed the importance of common sense in interpreting what had to be done. This openness and flexibility gives a great "human feel" to the Carmelite Rule. Prayer to St. Albert: Lord God, through St. Albert of Jerusalem, you have given us a Rule of life, according to your Gospel, to help us attain perfect love. May we always live in allegiance to Jesus Christ and serve faithfully until death Him who lives and reigns with you and the Holy Spirit, one God, for ever and ever. Amen. Albert, called by God’s favor to be Patriarch of the Church of Jerusalem, bids health in the Lord and the blessing of the Holy Spirit to his beloved sons in Christ, Brother B., and the other hermits, under obedience to Him, who live near the spring on Mount Carmel. Many and varied are the ways in which our saintly forefathers laid down how everyone, whatever his station or the kind of religious observance he has chosen, should live a life in allegiance to Jesus Christ, and how pure in heart and stout in conscience he must be—unswerving in the service of the Master. The first thing I require is for you to have a Prior, one of yourselves, who is to be chosen for the office by common consent, or that of the greater and maturer part of you. Each of the others must promise him obedience—of which, once promised, he must try to make his deed the true reflection—and also chastity and the renunciation of ownership. Those who know how to say the canonical hours with those in orders should do so, in the way those holy forefathers of ours laid down, and according to the Church’s approved custom. Those who do not know the hours must say twenty-five “Our Fathers” for the night office, except on Sundays and solemnities when that number is to be doubled so that the “Our Father” is said fifty times; the same prayer must be said seven times in the morning in place of Lauds, and seven times, too, for each of the other hours, except for Vespers when it must be said fifteen times. None of the brothers must lay claim to anything as his own, but you are to possess everything in common; and each is to receive from the Prior—that is from the brother he appoints for the purpose—whatever befits his age and needs. On Sundays, too, or other days if necessary, you should discuss matters of discipline and your spiritual welfare; and on this occasion the indiscretions and failings of the brothers, if any be found at fault, should be lovingly corrected. You are to fast every day, except Sundays, from the feast of the Exaltation of the Holy Cross until Easter Day, unless bodily sickness or feebleness, or some other good reason, demand a dispensation from the fast—for necessity overrides every law. Since man’s life on earth is a time of trial, and all who would live devotedly in Christ must undergo persecution, and the devil, your foe, is on the prowl like a roaring lion looking for prey to devour, you must use every care to clothe yourselves in God’s armor so that you may be ready to withstand the enemy’s ambush. Your loins are to be girt with chastity, your breast fortified by holy meditations, for as Scripture has it, holy meditation will save you. Put on holiness as your breastplate, and it will enable you to love the Lord your God with all your heart and soul and strength, and your neighbor as yourself. Faith must be your shield on all occasions, and with it you will be able to quench all the flaming missiles of the wicked one: there can be no pleasing God without faith; and the victory lies in this: your faith. On your head set the helmet of salvation, and so be sure of deliverance by our only Savior, who sets His own free from their sins. The sword of the spirit, the Word of God, must abound in your mouths and hearts. Let all you do have the Lord’s word for accompaniment. You must give yourselves to work of some kind, so that the devil may always find you busy; no idleness on your part must give him a chance to pierce the defenses of your souls. In this respect you have both the teaching and the example of St. Paul the Apostle, into whose mouth Christ put His own words. God made him preacher and teacher of faith and truth to the nations: with him as your teacher you cannot go astray. We lived among you, he said, laboring and weary, toiling night and day so as not to be a burden to any of you; not because we had no power to do otherwise but so as to give you, in your own selves, as an example you might imitate. For the charge we gave you when we were with you was this: that whoever is not willing to work should not be allowed to eat either. For we have heard that there are certain restless idlers among you. We charge people of this kind, and implore them in the name of the Lord Jesus Christ, that they earn their own bread by silent toil. This is the way of holiness and goodness: see that you follow it. The Apostle would have us keep silence, for in silence he tells us to work. As the Prophet also makes known to us: Silence is the way to foster holiness. Elsewhere he says: Your strength will lie in silence and hope. For this reason I lay down that you are to keep silence from after Compline until after Prime the next day. At other times, although you need not keep silence so strictly, be careful not to indulge in a great deal of talk, for as Scripture has it—and experience teaches us no less—sin will not be wanting where there is much talk, and he who is careless in speech will come to harm; and elsewhere: The use of many words brings harm to the speaker’s soul. And our Lord says in the Gospel: Every rash word uttered will have to be accounted for on judgment day. Make a balance then, each of you, to weigh his words in; keep a tight rein on your mouths, lest you should stumble and fall in speech, and your fall be irreparable and prove mortal. Like the Prophet, watch your step lest your tongue give offense, and employ every care in keeping silent, which is the way to foster holiness. You other brothers, too, hold your Prior in humble reverence, your minds not on him but on Christ who has placed him over you, and who, to those who rule the Churches, addressed these words: Whoever pays you heed, pays heed to Me, and whoever treats you with dishonor, dishonors Me; if you remain so minded, you will not be found guilty of contempt, but will merit life eternal as fit reward for your obedience.